MAYNARD — After renting in Somerville for a year, Dan Cirillo and his fiancé, John Pilosi, were ready to buy, but soon found that prices in the red-hot real estate markets in Somerville and surrounding communities were beyond their reach. Then, about 20 miles from their apartment, they discovered Maynard. 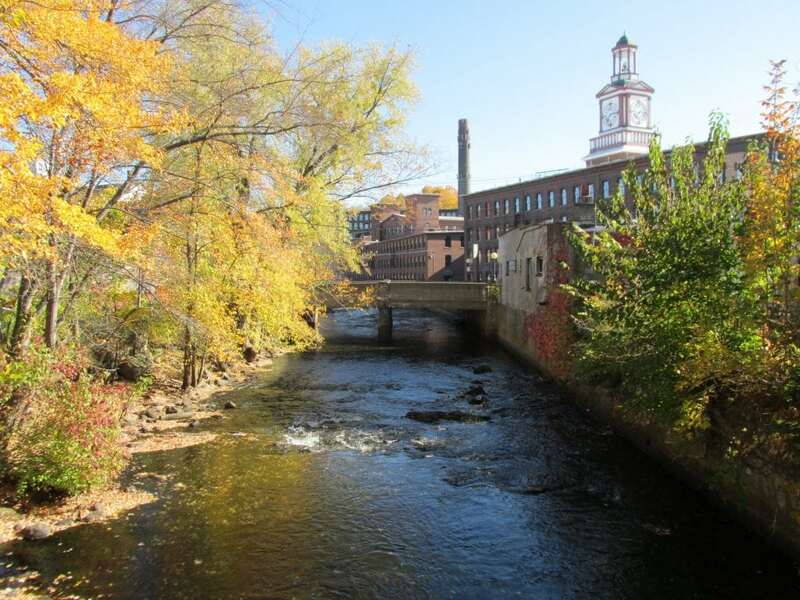 Not only did this old mill town offer affordable homes, but also amenities and character they enjoyed closer to Boston, including a walkable downtown, a burgeoning arts scene, and an array of coffee shops and restaurants. Ultimately Cirillo and Pilosi, both information technology professionals, bought a 1,400-square-foot Dutch Colonial last year for $325,000, about half what they might have paid in Somerville. Cirillo and Pilosi are among the young professionals that Maynard is attracting, helping to spur a development boom in a town that has struggled since the collapse of the computer maker Digital Equipment Corp. in the 1990s. Next month, Saracen Properties of Waltham will break ground on an $18 million project to redevelop Digital’s old headquarters at Clock Tower Place, a 1.1 million-square-foot mill complex. Saracen, which redeveloped the former Raytheon Corp. headquarters in Waltham into lab and office space, has designed an office and retail complex that will feature a boardwalk along Mill Pond, a pedestrian greenway, event venues, space for startups, and 100,000 square feet for artisanal restaurants and boutique shops. The first phase is expected to be finished next summer and the entire project completed in 2017. About 40 percent of the complex, dubbed Mill & Main, is already leased. Tenants include Stratus Technologies, a server and software company that recently leased 102,000 square feet, and Battle Road Brewing, which will open a brewery and pub in February. Saracen is not the only developer investing in Maynard. MacDonald Development Inc. built a $5.5 million building on Main Street last spring. Owner James MacDonald said all 26 apartments are rented and Nexus Dental, a family dental practice, occupies the 2,000-square-foot ground floor. Distinctive Acton Homes Inc. of Acton is developing 18 two- and three-bedroom townhomes at 129 Acton St., a 15-minute walk to downtown. The units are expected to sell for about $425,000. Capital Group Properties, which owns 58 acres at 129 Parker St., about 1.5 miles south of downtown, submitted plans for a $50 million development that will include 175 apartments and a 65,000-square-foot supermarket. The development boom represents a new direction for a town of about 10,000 people that has seen its share of booms and busts. A working-class community, Maynard grew up around its textile mill, which made wool blankets and flannels for the Union Army. The mill complex later became headquarters for Digital Equipment, once the second-largest computer company in the world. Digital, which faded as the personal computer supplanted its minicomputer technology, sold the property in 1995. Three years later, the property was sold again to Wellesley Rosewood Maynard Mills LLP, which renamed the complex Clock Tower Place and attracted new tenants, eventually filling the mill with 3,500 employees. But the recession that began in 2007 left the mill nearly empty and in foreclosure. When Saracen bought the mill in February, it was only 25 percent occupied. Maynard still faces challenges. The downtown, a 1-mile loop of shops and restaurants, is pocked with more than a dozen vacant storefronts. Taxes are also an issue; the commercial base never fully recovered from the demise of Digital, and the recession eroded it further. Meanwhile, the town borrowed heavily to build a new library, police station, and high school, contributing to the state’s third highest residential property tax rate: $22.31 per $1,000 valuation. (Maynard’s lower property values have kept tax bills lower than surrounding towns). “By many measures, our town’s finances are wearing the credit card shackle,” said Andrew Scribner-MacLean, assistant town administrator. Town officials and developers say they hope to meet these challenges by boosting the local economy, encouraging a diversified business district, and expanding the commercial base. The town is located just 5 miles from Route 2 and 2 miles from the South Acton commuter rail stop, which runs into Cambridge and Boston. Interstate 495 and the high-tech companies along that belt are 8 miles away, and single family homes can still be had for $250,000 to $300,000. Maynard also has the downtown feel of a small urban center amid sprawling suburbs. A 2014 economic development study by Brookline-based FinePoint Associates LLC envisioned a regional “food, culture, and entertainment destination” to attract well-heeled visitors from Concord, Acton, Sudbury, and Stow. Median income in Maynard is about $80,000, compared with more than $110,000 in Acton and more than $140,000 in Concord. FinePoint identified cultural assets such as Fine Arts Theatre Place, a 1940s cinema that recently underwent a $1.2 million restoration and now screens blockbusters and classic films. Artspace Maynard, a former schoolhouse, boasts 80 artists in 47 studios. Downtown mainstays include three art galleries and several cafes and eateries, ranging from Thai to Korean to pub food. The Assabet Village Food Cooperative, a three-year-old community initiative, has more than 500 shareholders and plans to open a community-owned grocery store in Maynard in 2017. At Scrub-a-Dog, a do-it-yourself dog wash that opened on Main Street in April, Patricia McCart welcomes her four-legged customers with biscuits. McCart, 55, groomed dogs at her Sudbury home for eight years, but said she moved to Maynard for its small-town, business-friendly vibe.